Coming home from the most Magical Place on Earth can be a difficult transition. After you have been immersed in the magic and fun of the Walt Disney World Parks and Resort, you get used to the magical atmosphere and the kindness of the cast members. You are quickly brought back to reality at the Orlando International airport, when, after removing your shoes and going through the metal detector, the TSA agent doesn’t tell you to “have a magical day.” The friendliness, cleanliness, and customer service of the Walt Disney World Resort is second to none and it can be quite jarring returning to the “real world” after your vacation. 1. Bring A Little Magic Home With You– If you are like me, while you were at the parks, you were tempted to overspend on souvenirs for your home. One of my favorite souvenirs is one that I use every day, my oversized Mickey coffee cup. It is my favorite cup and serves as a memory of a great vacation and a reminder to go back! While in the parks, scope out a special souvenir that you can bring home to help keep the magic alive! 2. Have a Disney Movie Night– Get in your jammies and sit down with the family to view your favorite Disney classic (or maybe a new favorite, Frozen is out on Bluray and DVD today!!!) Pop the popcorn, dim the lights, and enjoy the show! 3. Listen To The Disney Theme Parks’ Soundtrack– During each visit to the parks, we always buy the latest soundtrack and listen to it for at least three months after we get home. We play it in the car and while we clean up after dinner. It’s a great way to bring the magic of Disney into our home! 4. While in the Parks, Get Decorating Ideas– During our vacations at the WDW Resort, my wife and I look around for decorating ideas for our home. Our home decor is rustic country, so we have been able to get a lot of great ideas from the Wilderness Lodge, Port Orleans Riverside and Liberty Square in the Magic Kingdom. We even took pictures of rock walls around the Magic Kingdom to give us ideas before building our patio. While in the Whispering Canyon Cafe, beverages are served in mason jars. We now use mason jars as glasses in our home. Adding subtle touches to the decor in your home allows you to add magic to your home and is a constant reminder of your Disney vacation. 5. Make a Home Movie or Scrapbook of your Vacation– Take those pictures and videos of your vacation and make a home movie that the whole family can enjoy for years to come. Making a scrapbook is another fun way to remember the memories of your trip. 6. Host a Character Meal in your Dining Room– Have your children dress as their favorite Disney characters for a special dinner. Prepare foods that you enjoyed at Disney restaurants. Consider making your own Mickey-shaped rice crispy treats just like the ones in the parks. Act as an official photographer and take pictures of your dining event. 7. Two Words: Mickey Pancakes!! !– You know you love them! 8. Start Planning Your Next Vacation– Admit it, you have a problem. Begin dreaming and saving for your next Disney Vacation. 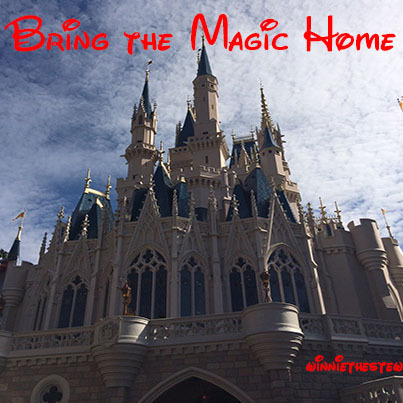 How do you keep the Disney magic alive upon your return home? Would like to hear your thoughts and ideas. This entry was posted in Uncategorized, Walt Disney World and tagged Coping with Disney Withdrawal, Disney Movie Night at Home, Disney Withdrawal, Keeping a Disney Vacation Alive. Bookmark the permalink.